On Thursday the Speaker accused Daniel Kawczynski MP of "rushing" to judgment on the appearance of police officers at his Commons office. Mr Kawczynski is persisting in his concern that the police behaviour was inappropriate and has written to the Speaker setting out his concerns. The full text of his letter is pasted below. > Newsnight's Michael Crick has blogged on the issue and in sympathy with Daniel Kawczynski. Is the Damian Green affair about to take a more sinister twist? "My gut feeling tells me that the Damian Green affair will expose an interesting further abuse of power. I suspect the Police have been accessing the House of Commons server. Fascinating, I hear you say. Well hang in there with me and you will see where this is going. Accessing the server is no different to searching my office. On this system will be every email I have ever received or sent through my office or when working from home, on my Parliamentary email. If they need a warrant to search Damain’s office they sure as hell need one to follow an email trail through the server and the House of Commons computer system. It is for this reason that I asked the Speaker in a Point of Order last week where the server stood in relation to the Damain Green affair and something called the Wilson Doctrine. The latter was a protocol agreed in the 1960s about the bugging of MPs. I have just heard that the Speaker will make a statement on this matter at 3.30 pm this afternoon." 3.35pm: The Speaker has told the Commons that no access was given to the server and no access was taken. Despite the best efforts of the Government Damian Green MP is here in the Commons today. We have a right to know that the Home Office is riddled with illegal immigrants and that the Home Office - not the Government Whip's Office - is studying the voting behaviour of Labour MPs. If the approach taken against Damian Green was pursued when the Prime Minister was in opposition he'd have spent a lot of time in prison. He received leak after leak. What the people want to know is if the Prime Minister has the courage to defend the integrity of the Commons and the right to question Government. It's time for him to come off the fence. Ten minutes after getting up to speak Mr Cameron turns to the issues raised in the Queen's Speech. Mr Cameron says any increase in UK troops in Afghanistan must be accompanied by a much greater commitment from other NATO nations. We welcome the NHS Constitution, the independent exam regulator, more security for ports and airports and greater police accountability - all Conservative ideas. The PM says we have no substance. Without Tory substance there'd be nothing worth having in this Queen's Speech. More maintenance grants for students, EcoTowns and more powers for parliament to question the executive - again and again the Prime Minister promises things but doesn't deliver them. There is no social reform or public service reform in this Queen's Speech. And let's look at Labour's economic record. No prudence - we have the largest deficit in the developed world. No stability - with unemployment rising. No end to boom and bust - but the biggest bust because we had a debt-fuelled boom. The real division between the parties is not, as the Prime Minister likes to pretend, between action and inaction but between the right action and the wrong action. The right action includes the kind of insurance for bank lending that Conservatives announced last week. We need a long-term plan to bring the public finances under control and reduce the long-term demands on government. The Prime Minister constantly assumes that the British people are stupid; that they won't realise that large tax rises are going to be necessary to fill the black hole in the public finances or that every economic problem in Britain is all America's fault. As long as he treats them as fools they'll never accept him as their Prime Minister. 2.30pm: I did not want to make comment about "grave" matters surrounding arrest of the Member for Ashford, Damian Green to anyone other than the House. Today I do not intend to comment on the allegations facing Mr Green. Parliamentary privilege has never prevented the operation of the criminal law. The precincts of the House cannot and should not be a haven from the law. The Metropolitan Police informed the Sergeant-at-Arms that an arrest of a Damian Green was possible last week. I was not told that the police did not have a warrant. The police did not tell the Sergeant that there was a right to object. I regret that a consent form was then signed by the Sergeant without alerting the Clerk. I never personally authorised the search of the office. In future a warrant will always be required for a search and my personal approval will be required. A new protocol will be released formalising this. I am establishing a committee of seven senior MPs to investigate this matter and there will be a debate in the Commons next Monday. 2.40pm: Michael Howard rises to make a point of order - calling the arrest of Damian Green an "attack" on parliament - and calls for freedom in next Monday's debate to question Government Ministers and House authorities. 2.42pm: Ming Campbell rises to ask if the new Speaker's committee will examine the behaviour of the police as well as the House authorities. 2.45pm: John Reid rises to say that the Speaker's inquiry must also ensure that MPs are not protected from proper police enquiries. 2.46pm: Damian Green rises to say that an MP who exposes government failings should not be treated the same as an MP who endangers national security. 2.47pm: Iain Duncan Smith expresses concerns that the Government should not be able to draft a motion next Monday that prejudices the terms of the debate. 2.50pm: Douglas Hogg says it is a "scandal" and "deplorable" that Commons authorities had a right to refuse request to search Commons office. 5.30pm VIDEO of Michael Martin's statement. A MASSIVE INCREASE IN THE PUBLIC DEBT. THE FACT THAT BRITAIN IS FACING THE MOST SEVERE RECESSION OF ALL DEVELOPED NATIONS. TODAY'S TEMPORARY TAX CUTS WILL BE FOLLOWED BY LARGER TAX RISES WITHIN A YEAR OR TWO. Congratulations George. Now we want you to bring forward Tory announcements on waste-funded tax reliefs - the proceeds of which can be shared with tighter control of borrowing. But that's for another day. ConHome has always thought Osborne would survive as Chancellor. We are beginning to believe that he'll succeed too. Reason one: His weekend performance. His time-to-tell-the-truth interview with Andrew Marr was one of his best performances in recent times. It was also impressive to see colleagues and a former Chancellor coming to his aid over his remarks on sterling. The ex-central banker in me worried about what he told Saturday's Times but 48 hours on, George Osborne has been justified. Reason two: A desire for unity in the party. The very negative reaction to Ridley Grove's call for Osborne to be moved was striking. Reason three: The promise of waste-funded tax cuts. The fiscal conservatives and the small state conservatives may both be happy soon - reinforcing reason two. Fiscal conservatives will be happy at George Osborne's insistence that borrowing can't get any bigger. Small government conservatives (and supply-siders) can be encouraged that Oliver Letwin's review suggests a renewed concern about the wastefulness and inefficiency of Labour's bloated state. If Britain is so well-prepared why will our economy shrink faster than all our major competitors according to the IMF and the EU? Cameron said that Gordon Brown was beginning to sound "ridiculous" blaming everything on America. Britain he said had a weak currency because it had a weak economy and a weak government. After using these words David Cameron revealed they were actually Gordon Brown's from the past. Higher taxes are Labour's secret agenda. Labour's borrowing bombshell will become a tax bombshell soon. £30bn of borrowing will become a £1,500 bill in higher income tax in future years. "Tax cuts should be life, not just for Christmas". There is plenty of material in those three points for some very hard-hitting political campaigning. We thought we'd resurrect the above graphic (from last October) to mark Labour's latest attempts to copy Tory policies. 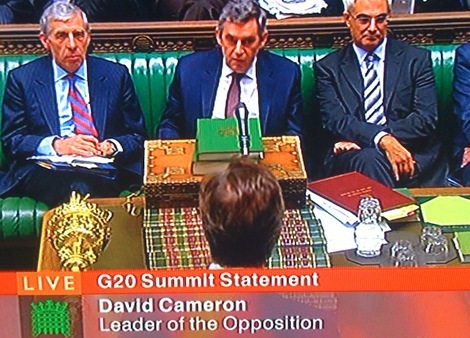 Brown made his draft Queen's Speech statement earlier and David Cameron noticed quite a lot of policy pinching. 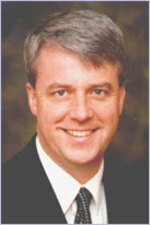 During PMQs Brown had accused the Tory leader of being shallow. Cameron responded: "He can’t really say we haven’t got any substance when he’s taken it all and put it in his Queen’s Speech." CCHQ has just published a "dirty dozen" of Tory policies that Labour has stolen (but won't implement properly). See this PDF. The text of David Cameron's full response to the Queen's Speech is here. 3.49pm: Darling - Individual tax allowance up £600 but (IT SEEMS) for just one year - to £6,035. What are the long-term plans to compensate people? This is just a one-off measure - like the pre-election council tax discount. 3.55pm: Vince Cable welcomes the statement but attacks Darling for not giving him or George Osborne any pre-notification of the announcement. He asks how many people will NOT be fully compensated by this move and urges the Chancellor to reconsider giving a rebate to people. 3.58pm: Frank Field apologises to the Prime Minister for what he said at the weekend about Mr Brown. 4.05pm CONSERVATIVEHOME'S VERDICT: Cynical? Yes. Related to the by-election? Yes. Forced upon Labour? Yes. Even more borrowing? Yes. The right thing? On the face of it, Yes. As Lord Forsyth advocated some weeks ago: Raising the personal tax allowance was the right response to this issue. The Tories should have recommended this option weeks ago, too. We should now press for these higher thresholds to be made permanent. It is right that as many low income people as possible are taken out of the tax system. 4.30pm: Nick Robinson's take: "Labour MPs are happier than they have been for weeks and the Tories, for the first time in a long time, look wrong footed." 4.43pm: Download PDF of full statement from George Osborne. 4.49pm: Guido welcomes Labour's "unfunded tax cut"! 5.59pm: From George Osborne: "What he didn’t tell us was that 1.1 million low earners on between £6,635 and £13,355 will still be worse off, by up to £112 a year. So the poorest people will still lose out." Tory winners: Hague V Miliband; Davis V Smith; Duncan V Hutton; Gove V Balls; Hammond V Cooper; Hunt V Burnham; Strathclyde V Ashton. Tory losers: Ainsworth V Benn; Herbert V Straw; Lansley V Johnson; Villiers V Kelly. Most surprising Letts' verdict: "George Osborne v. Alistair Darling, Chancellor. For all Darling's troubles he has not yet been comprehensively bettered in the Commons by his shadow. 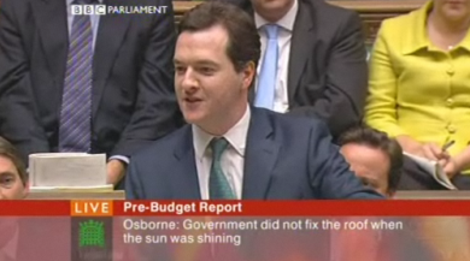 Osborne found it easier to score against Gordon Brown. It's never easier playing an underdog. Score draw." Meanest Letts verdict: "Theresa May v. Harriet Harman, Leader of Commons. Kitten-heeled May is no Cicero and makes far harder work of Harman than she should. If it's possible for both teams to lose a match, this is it." This was a budget of reannouncements. It was delivered with all of the excitement of reading out a telephone book. This Government is not living in the same world as the rest of us who are paying more for our petrol and mortgages. As this country enters troubled time we could not be less prepared. We have the highest tax burden ['So what?' interjects Ed Balls!!]. The worst budget deficit. The highest interest rates in the G7. This Government did not use the good times to prepare Britain for bad times. Debt is £100bn more than planned leaving no room for manoeuvre. Other countries have room to cut taxes to help them out of recession. Britain could not be less fiscally prepared for these bad times. Whatever measure you take inflation is higher than in 1997. The real inflation rates paid by families in Britain are much higher than the Government acknowledges. Taxes are being raised on the very businesses and enterprises that we need to grow the economy. He didn't mention the abolition of the 10p income tax band. But because of that low-paid NHS workers will pay more tax. Part-time teachers will pay more tax. Soldiers fighting in the heat of Afghanistan will be paying more tax. 5.3m of the lowest paid will be paying more tax. Higher green taxes would be used to help all families. We'd scrap complex business tax allowances to reduce corporation tax on all businesses. We'd target higher taxes on alcohol on those drinks used by binge-drinkers. [After another Balls' interjection, Cameron responds: He may be minister for children but he doesn't have to behave like one]. The City may be having a credit crunch but this Government is having a credibility crunch. All over Britain people are wondering: I'm paying more tax post so why is my post office closing? I'm paying more tax but my maternity ward is closing? I'm paying more tax but I see so much waste? The Prime Minister who got us into this mess cannot possibly be the man to get us out of this mess. The benches behind him were relatively empty this afternoon as the Prime Minister got up to deliver a report on last week's EU summitry. Although Mr Brown did not mention the Lisbon signing neither David Cameron nor Vince Cable were willing to let him push the issue under the carpet. David Cameron said that the Prime Minister will not restore trust in politics until he grants a referendum. This issue will not go away, the Leader of the Opposition insisted. The Prime Minister's behaviour is making him look "shifty" and "untrustworthy". As Mr Cameron concluded he suggested that Mr Brown was "weak", "dithering", "second-rate" and "not straight with people". In his last Commons appearance as acting LibDem leader, Vince Cable said that the Prime Minister had been "incompetent" for not organising his diary so that he could attend the Lisbon signing, or "discourteous" for not having tried or "duplicitous" for trying to have a halfway house of signing when noone else was there. Listen to Brown's statement via ToryRadio. 4.30pm: Download PDF of David Cameron's EU statement. 6.45pm: Guido has a graphic that the Brownites will hate. 4.30pm: I won't endear myself to the diehard loyalists with this verdict but Brown did okay this afternoon. He wasn't as witty as Cameron. Nor as smooth. But he was weightier. Cameron's remarks were light on policy. Peter Riddell wrote last week that our party still had some way to go on policy substance. Peter was right. Brown also thinks he is on to a winning theme with whether or not the Conservatives will hold a referendum on the EU Treaty, should it be ratified. He kept inviting David Cameron to say whether he would or not. An uncomfortable-looking Cameron stayed glued to the green benches. He did get up later - challenging Gordon Brown on whether he had looked at the opinion polls before cancelling the election and if he had planned to cut IHT before the Tory plan was announced. The Tories roared with laughter when Brown said the IHT tax cut had been long in the pipeline. I wouldn't say that Brown won the exchanges but this was an improved performance and a clear signal of his attempt to revert to his pre-Chicken Saturday strategy: I'm fit to be PM; Cameron is all PR. Brown will find that a much harder sell than it was six weeks ago. Fraser Nelson otoh thinks Cameron easily won the exchanges. 4.25pm: Download a PDF of Cameron's full text. ToryRadio has the audio. 3.30pm: David Cameron finishes by listing what Britain really needs. He lists key Tory pledges on school reform, the environment and the family. 3.28pm: This is an incompetent government. Its own lab caused Foot and Mouth. We've had the first run on a British bank. The Government doesn't know how many immigrants are in Britain. The PM's British Jobs for British Workers pledge is illegal. Where was the PM's moral compass when he borrowed slogans from the BNP and National Front? 3.27pm: This is a government of dithering and U-turns. School surpluses. Taxes on bins. Entrepreneurs pay CGT. And then the biggest U-turn of all - the election was called off. We've swapped a strong PM for a weak one. 3.25pm: Labour backbencher asks if Cameron will offer a referendum if the Treaty is ratified? Cameron responds by saying he wants a referendum now and calls on Labour MPs to vote for it. 3.24pm: There is only one black hole in British politics and that's where the Prime Minister's credibility used to be. 3.21pm: Where is the Government's vision? His Budget wasn't a tax cut, it was a tax con. His Party Conference speech was a laundry list of small promises. It was a speech borrowed from John Kerry. The Pre-Budget Report had a flight tax, inheritance tax and non-dom tax - all taken from the Conservatives. The PM has nothing new to offer. 3.20pm: Attacks proposed abolition of A-levels, slamming on the brakes on City Academies and Labour's obsession with top-down control. 3.19pm: Attacks the PM's promise of deep-cleaning for the NHS. What needs a real deep clean is the Government's reputation for half-truths. 3.17pm: The real problem with this Prime Minister and this Queen's speech is that it's all quick fixes and no long-term thinking. 3.16pm: Quick mention of Brown's broken promise on referendum. 3.15pm: There is no case for extra state funding of political parties unless there is a cap on all sources of donation. Having chickened out of one election, Brown wants to fix the next. 3.15pm: Welcomes Counter-terrorism Bill and inclusion of Tory recommendation of post-charge questioning. 3.13pm: We welcome some Bills - not least those we proposed. Some of these Bills have been recycled including the one on CrossRail - announced 11 times before. 3.12pm: After jokey responses to the traditional speeches from the Government backbench David Cameron invites the Prime Minister to comment on strategy in Afghanistan. David Cameron began his response to the Prime Minister's statement on the EU Treaty by noting that Mr Brown didn't mention the issue of a referendum once. 'If Labour can't trust the people, the people can't trust him,' he charged - echoing the words of Labour MP Gisela Stuart. That this Treaty gets rid of the national veto in 60 areas. An EU President, Foreign Minister and diplomatic service would be created in all but the name. A new ratchet clause will be effected that will allow more vetoes to be scrapped without an IGC. This ratchet clause will allow institutional changes every year. The Irish PM says that this Treaty represents 90% of the Constitution; the Spanish PM says 98% the same; Chancellor Merkel says the substance of the Constitution has been preserved. His new Minister, Lord (Digby) Jones of Birmingham has said that it's a con to call it a Treaty, it's a Constiutution. His Labour colleagues on the EU scrutiny committee say that the Treaty is substantially equivalent to the Constitution. "You promised a thousand of our troops would be brought back before Christmas - but isn't it the case that 500 of them had already been announced and 270 of them were already back in the country? I have to say to the prime minister, this is of a different order of magnitude to what we've had from him over the last decade. This is not double-counting of government spending, this is not just spinning the good bits of a Budget, this is about dealing with people's lives and the families of our servicemen. And does he agree that this is just not an acceptable way for a prime minister to behave?" He promised twelve transfer of powers from the Prime Minister and the Executive to Parliament - including the Executive's powers to declare war, request the dissolution of Parliament and key public appointments (including the Governor of the Bank of England and Church of England bishops). He promised the creation of a National Security Council - an idea already proposed by Pauline Neville-Jones some months ago (he went on to nick at least two other Tory ideas). He promised a new ministerial code overseen by an independent adjudicator. He also called for a cross-party debate on a new written Constitution and floated ideas such as weekend voting and a lower voting age. In his only clear nod to the LibDems on PR he promised a full report on the success of the new voting methods used since Labour came to power. Some civil libertarians would be pleased with his announcement that the restrictions on protests in Parliament Square could be lifted. "Constitutional change is not the solution because the constitution is not the cause: the cause is broken promises. People will ask how the person who broke this trust can be the person to mend it." British life is too centralised, the Leader of the Opposition said, and Gordon Brown had been the great centraliser of the last ten years. The new Prime Minister wants more openness and honesty but as Chancellor, Gordon Brown had levied taxation stealthily and failed to answer questions on the tax credit chaos. He challenged Gordon Brown to reverse the transfer of power from democratically elected local councils to unelected regional assemblies. What was the new Prime Minister going to do about the fact that there were two classes of MP in Britain? MPs for English seats who had no influence on Scottish matters and Scottish MPs like Gordon Brown who could decide how English hospitals and schools were run. He ended with an attack on Gordon Brown's failure to grant a referendum on the draft European Treaty. It was, David Cameron said, yet another broken Labour promise. The Prime Minister responded by joking that he thought David Cameron had wanted to end Punch and Judy politics. He quoted Ken Clarke two or three times to back up his positions and embarrass David Cameron but this was definitely an exchange won by the Conservative leader. He will have raised morale on the Tory benches. It's the first Brown-Cameron PMQs tomorrow. ConservativeHome will be live blogging it. Speaking in the Commons this afternoon (where the number of Tory MPs appeared to significantly exceed the number of Labour MPs), the Conservative leader David Cameron said that the issue at stake in discussion of the Constitution/ EU draft Treaty was whether this Government was serious about listening to people or not. Addressing The Prime Minister, Mr Cameron said the failure to agree to a referendum would "be remembered as one of the most flagrant breaches of any of the promises you have ever made." He said that the Treaty was largely the same as the Constitution and quoted remarks from Bertie Ahern and Angela Merkel in support (Open Europe have a full list of Constitution-friendly EU leaders telling their electorates the same). Mr Cameron went on to say that there were sixty areas where Britain would lose its veto - including energy, transport, the EU diplomatic service and employment law. The EU was lacking the political will, he concluded, to tackle the real issues of climate change and economic competition. Mr Brown, the Conservative leader concluded, had promised to be humble, a servant of the people and to listen. Voters would only take these words seriously if he let the people decide on this Treaty. David Cameron: "The tragedy of this Prime Minister is that he’s promised so much and delivered so little." Things to welcome in the Speech: "I am delighted the Government is to link the basic state pension with earnings – our proposal at the last election. The Treasury has finally been forced to make the provision of statistics independent. Again, something we called for at the last election. And then there’s the Climate Change Bill – proposed over and over again by Conservatives, and opposed by the Prime Minister. Can I say how delighted I am to see a Bill in the Gracious Speech? I hope it will be a proper Bill and not a watered down Bill. Government has to give a lead by setting a proper framework. That must mean an independent body with annual targets and an annual report from government on its progress." Iraq: "There are no easy options. Militarily, we must do all we can to build up the Iraqi army. Diplomatically, we need to involve the regional powers. While there is merit in contact with Syria and Iran – after all, the point of diplomacy is to talk to countries well beyond our traditional friends – it is on the moderate Arab governments that our efforts should concentrate. Their support for stability in Iraq is what we most need. And the key to securing that support is a fresh and unremitting push to resolve the Israel-Palestine conflict. I hope the Prime Minister will press President Bush to use America’s influence to the full to achieve this, as well as enlisting the support of Europe. Taking these steps and maximising stability is the right background to bringing our troops home. But we should not set an artificial timetable." Northern Ireland: "Turning to Northern Ireland, we back the efforts to restore power-sharing devolution in Northern Ireland. We are clear that if it is going to succeed then Sinn Fein must support the police, the courts and the rule of law. They could start by telling their supporters to co-operate with the police investigation into the brutal and callous murder of Robert McCartney. When people look back at the Prime Minister’s time in office, they will give him enormous credit for his unstinting efforts to bring peace to Northern Ireland." The Blair years: "After three massive majorities, almost a decade in power, 10 Gracious Speeches, and 370 pieces of legislation, the question they have to answer is why has so little been achieved? It’s because they have put headlines above delivery. They believe in centralised power, not social responsibility. And, all too often, they’ve passed laws to score political points, rather than to achieve real change. And Mr Speaker this Queen’s Speech is no different. It’s so repetitive and so hollow that people know they’ve heard it all before." No action on the causes of crime: "At the beginning of his time, the Prime Minister offered the nation hope that he would tackle the causes of crime. As we look at the measures placed before the House today, all we see is the betrayal and debasement of that vital agenda. Nothing about family breakdown. And nothing about tackling addiction and dependency. The Prime Minister’s simply given up on the causes of crime. All we get is a series of eye-catching initiatives, which last about as long as a news bulletin." Download PDF of full text of David Cameron's response. Please use the thread below to post your reactions to The Queen's Speech. "Today's proposals threaten to make the already draconian restrictions on civil liberties in Britain even worse. It seems that the Government may even try to reintroduce the defeated plans for internment for 90 days without trial or charge. The Mental Health Bill would give yet more questionable powers of imprisonment to the State, allowing people innocent of any crime to be locked up. The vandalism of our justice system and historic freedoms seems set to continue apace."" Mr Lansley is, of course, right. Labour's frontbench have been consistently outwitted and out-fought by an increasingly assertive parliamentary Labour party, unwilling to tolerate the high-handedness of their frontbench - high-handedness that they found insufferable during the last two parliaments with Tony Blair's three figure majorities. The newly empowered Labour backbenches are not going to stop asserting themselves now that they have tasted power. But if, after this vote, backbenchers and parliament are stronger against the executive, the freedoms of groups to associate together are weaker. That is certainly the conclusion of Robert H Halfon, our prospective parliamentary candidate for Harlow. Robert sets out his objections to the ban on smoking in private clubs in the exclusive text below. He argues that "Banning smoking may be good for a health, but it represents a fundamental assault on our civil liberties." "Last night something remarkable happened in British politics. Far more important than the ban on smoking in public was the ban on smoking in private clubs. The implications of this are enormous. The Governnment have ruled that a group of individuals cannot get together in an association and smoke, even if every member, including staff agree to do so. Of course there is a case for banning smoking in public places (not an argument with which I agree, given that restaurants etc can have special rooms and smoke filters), nevertheless there may be those who believe that the health argument is so great that the public deserve to be protected. But the ban on private clubs is a step too far. If the state can interfere in the running of private clubs in this way, where next? What happens if the state decides that alcohol is harmful? What happens if the state decides it doesn't like certain political activity? In short the vote banning smoking in private clubs has established a nasty precedent and given the Government unprecedented powers to intefere in civil society and private association. This has not been a good few days for civil liberties. First the Government tried to appease Islamic fundametalists over the Danish cartoons; second the Government have forced ID cards through the Commons; and now we have legislation allowing the state to control the activities of private clubs. Little by little, important civil liberties are being whittled away by stealth. Now we hear the Government want to abolish next year's local elections in the interest of 'local government reform'. We may not be thankfully under dictatorship, but this is not how a free, open and democratic society should work." "On the budget, does the Prime Minister remember having three clear objectives? First, to limit its size, when almost every country in Europe is taxing and borrowing too much. Second, to ensure fundamental reform of the CAP. And third, to keep the British rebate unless such reform occurs. Isn't it now clear that he failed in every single one?" 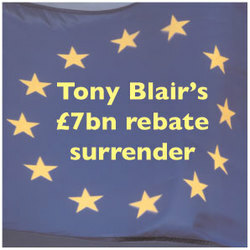 Why did he give up £7 billion for next to nothing? And - vitally - how is the Chancellor going to pay for it? More taxes? More borrowing? Or cuts in spending? Which is it? A good budget deal would have limited spending. It would have reformed the CAP. And it would have helped change Europe's direction. Isn't it the case that none of those things happened under the British Presidency? Europe needed to be led in a new direction. Aren't we simply heading in the same direction, but paying a bigger bill?" "To have championed the cause of these new states; to have welcomed them into NATO and Europe and then to have refused to agree a budget that protects their future economic development would have been a betrayal of everything Britain has rightly stood for in the past 15 years or more since the fall of the Berlin wall. They are our allies. It is our duty to stand by them. But it is also massively in our interest." Read the full text of David Cameron's Commons speech. "Labour MP Dennis Skinner has been banned from the Commons for the rest of Thursday for accusing shadow chancellor George Osborne of snorting cocaine. The claim came as Mr Osborne took on ministers at Treasury questions. Referring to the 1980s, Mr Skinner said: "The only thing that was growing then was the lines of coke in front of Boy George and the rest of the Tories." "Dennis Skinner's Commons outburst against the new Tory team is by no means the first time the MP dubbed the Beast of Bolsover has fallen foul of such rules of Parliamentary behaviour. In 1992, the plain-speaking scourge of sensitive Speakers - was ejected for calling the, then, Agriculture Minister John Gummer a "little squirt of a minister" and a "wart". He was also removed for the day by former Speaker Betty Boothroyd in 1995 for accusing ministers of engaging in a "crooked deal" to sell off the coal industry. In 1981 he was also "named" - the next stage up in the Speakers' disciplinary weaponry - and banned from the chamber for five days."